AlphaNinja: Valero guides down....is it a buy? 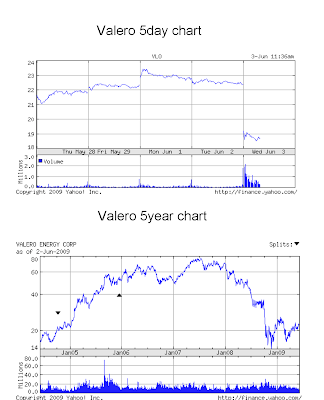 Valero guides down....is it a buy? AlphaNinja - Refiner Valero drops a BOMB on the street - sees a loss of 50cents per share while the street had been expecting a profit of about 75cents. This brings full-year earnings estimates down to about a dollar versus 2.40 previously expected. "The company’s second quarter 2009 results have been adversely affected by extended downtime at its Delaware City and McKee refineries and by the continuation of weak sour crude oil discounts and lower diesel margins." Is Valero biting off more than it can chew, with its recent purchases of ethanol plants, and its possible future plans for more acquisitions? One thing is for certain - they're extremely ambitious. "In the last three months, the company has acquired seven ethanol plants and a site currently under development from VeraSun Energy Corporation for $477 million, excluding working capital, and announced its pending acquisition of The Dow Chemical Company’s 45% interest in Total Raffinaderij Nederland N.V. (TRN), which owns a crude oil refinery in The Netherlands, for $600 million, excluding working capital. The company also expects its total capital expenditures in 2009 to be approximately $2.5 billion, of which approximately $1 billion is for strategic projects.